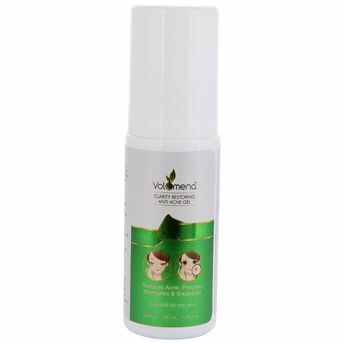 Volamena Clarity Restoring Anti Acne Gel has Organic Anti Acne Active system from the Amazon rainforest containing Balsam Copaiba Resin (and) Carapa Guaianensis Seed Oil (and) Euterpe Oleracea Fruit Oil which improves oily skin health, reduces the effect of acne, regulates the balance between moisturizing and oil production. A miracle solution for blackheads, pimples, acne and problem skin. This refreshing, exfoliating and anti-bacterial gel tightens pores, averts blemishes and keeps skin nourished and clear without flaking. It cleanses dead skin cells so deeply and thoroughly with no pore-clogging. It controls excessive sebum and reduces the secretion of oil and further breakouts. It retains skin moisture and improves general skin health. It nourishes and rejuvenates the skin, making it soft and smooth.